Scrap the Stash: "The Scrappler"
Time-out! Someone or something needs to go for a nap. 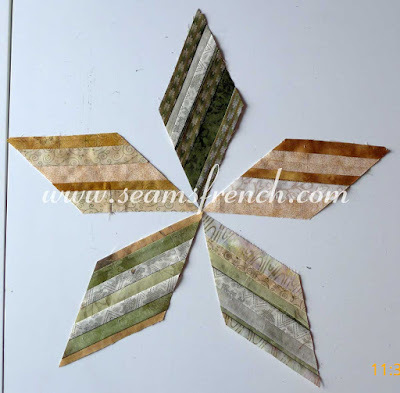 "The Scrappler", as I have named this unruly, tenacious compilation of strips, stripes and wonky, has had me out of my comfort zone long enough for the time being. By February 29th, I had 60 blocks made from this first set of scraps. Since my goal is 366 for the year, (readjusted when I realized it's a leap year), I'm on schedule. Because I wanted to eliminate as much trimming and waste as possible, I let the scraps dictate the form the blocks would take. 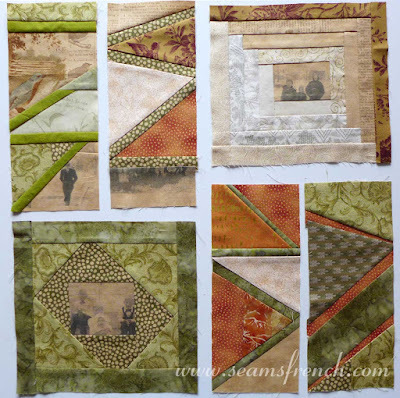 Below is the last set of blocks I made from this particular conglomeration of scraps. 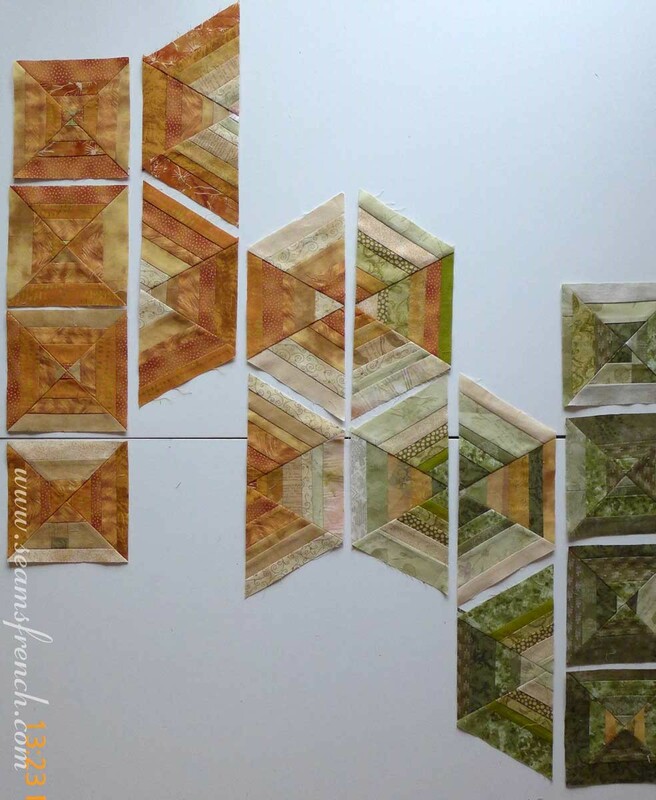 By this time, there had been a lot of trial and error with colour placement and piecing ideas and I'm happier with these results then with the earlier blocks. Made only from strips, this is the last set of blocks I made from this particular bunch of scraps. 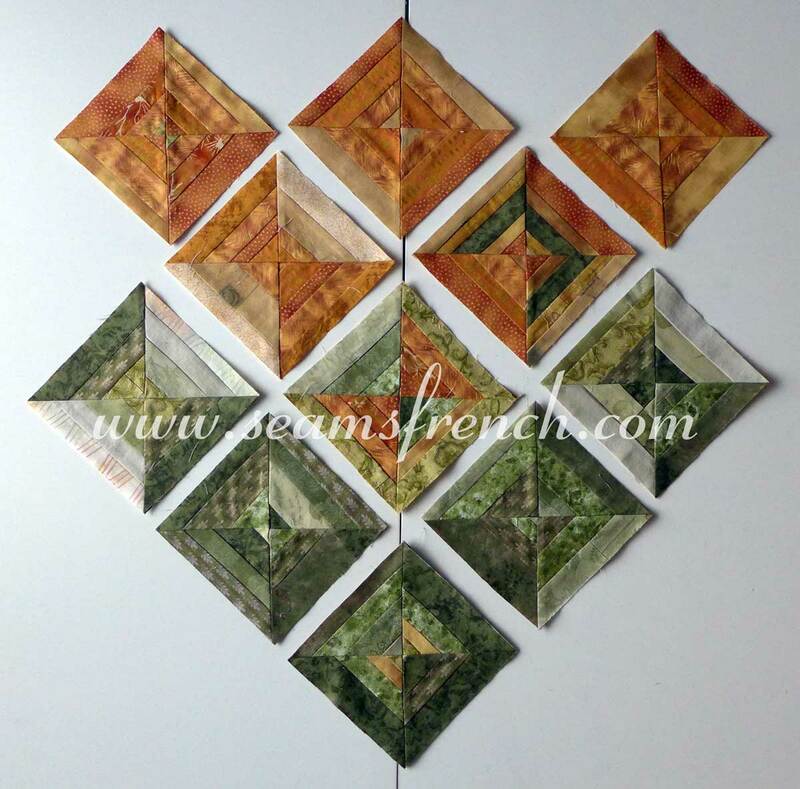 The trial and error method started with these first two sets of blocks (next two pics below). I don't mind the sometimes on and sometimes off wonky log cabin blocks as much as I dislike the green and gold 4 1/2 x 11 1/2" rectangular blocks, but both left me feeling seriously frazzled and out of control. 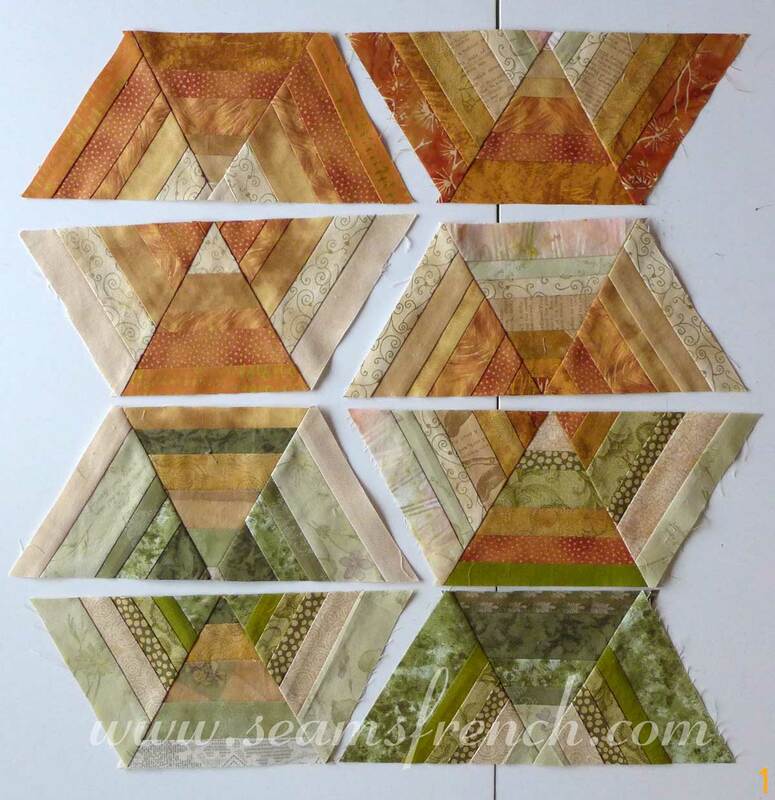 There is too much irregularity in the blocks, from the contrasting sashing to the irregular angles of the piecing. The effect is jarring and chaotic. I tried a number of different layout possibilities, but I'm really at a loss as to how to use them. They desperately need some calming solids between and behind them to quiet the noise. 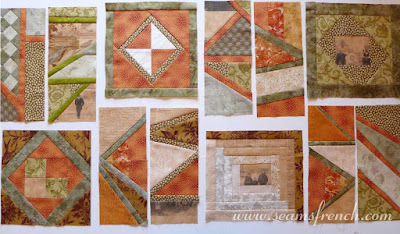 Perhaps the best thing would be to make two separate quilts from these first two types of blocks, using them more as an accent rather then the focus of the quilt. Many of the scraps in the stash are excess strips from prior projects, so for the next 3 types of blocks, including the 6" x 6" blocks in the first photo on the post, I focused on the strips. These results leave me a little less frazzled and I feel that I can make them work together. 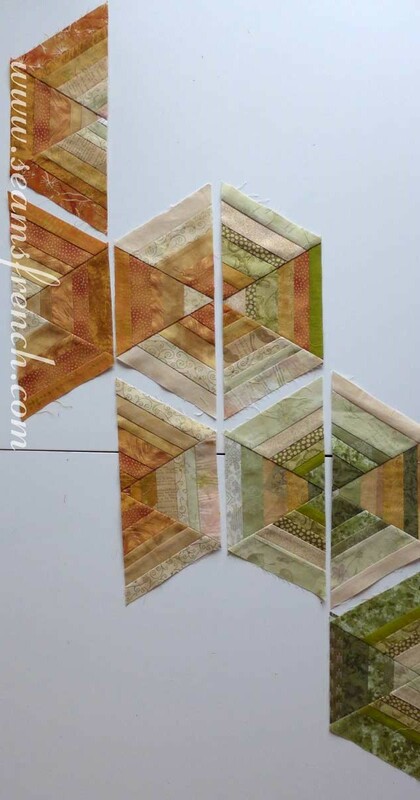 There are still plenty of scraps left in these colours to make more blocks of any type to build a final layout. Diamond stripes cut on point. Below are some ideas of how I might build the final layout. Filling in with a select few of the longer rectangular blocks. There is still a lot of thought and play needed before I'm ready to commit these scrappy little blocks into a quilt top, but for now we, (the blocks and I), need a break from each other. So nap time it is for the green and gold! As frustrated as I was with this first scrappy mess, it has not deterred me from the challenge of improv quilting. My second Scrap Buster is already well under way. This next one is starting out with a basic plan and an idea of where it's heading. The scraps will still dictate the blocks, but with a few more controls in place. In the meantime, the process is still fun and I intend to see it through to 366 blocks by the end of 2016. Oh yeah, and have fun! Thanks for the vote of confidence. The colourwash effect makes the most sense to me as well and is likely the way it will end up. Being out of my comfort zone is not a bad thing and I do mean to hang in there. So yeah, I guess I am having fun with it. Thanks! The colors you are using play so well together that your finished quilt will be quite lovely. Don't be frazzled! But sometimes you do have to put it away and think about it. One block a day! Amazing! Thanks Cynthia. 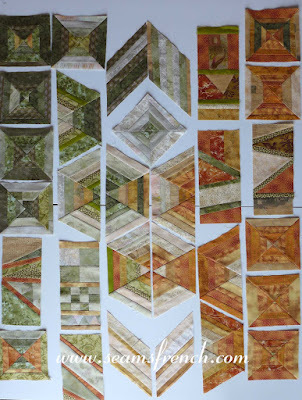 I'm happier with the last 3 sets of blocks I made,but this whole "improv" thing is a bit of a shock to my system. Frustrating as it's been, I find the challenge good for me, so I'll keep at it. 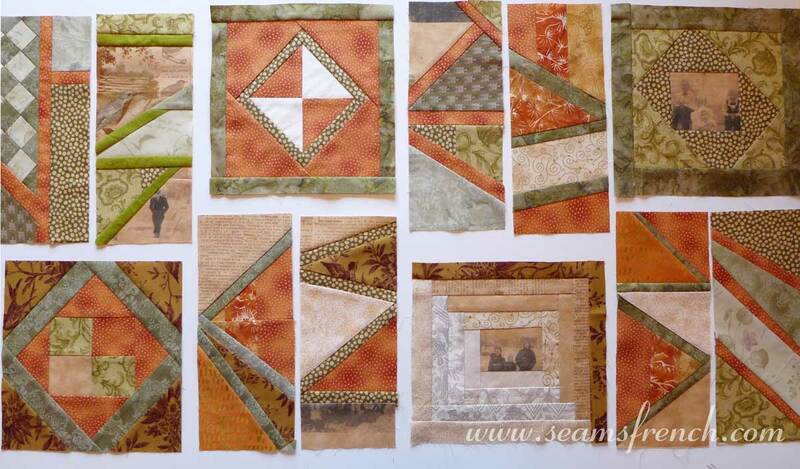 You have so many interesting shapes, I know that you are well on your way to an amazing quilt. I am very familiar with the need to "park" a project and talk a break (or a nap). I hope you return to it with a new clarity. This is my first "scrap/improv" quilt, and I am learning on the job, so to speak. I love the concept of using what is available and your quilts have provided a lot inspiration.